One could argue that ESPN was all about the College Football fan. 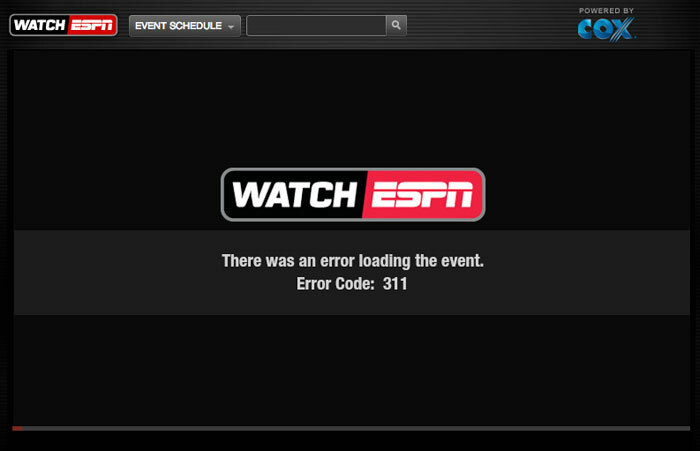 No matter the game, ESPN seemed to carry it on one of its many platforms. Now, ESPN has taken a step backwards. It has let an old TV mindset takeover and in the process screw the College Football fans in the digital age. Last season, it was a College Football fanatics dream. If you were on DirecTV (which a lot of sports fans are because of NFL Sunday Ticket) and had an internet connection (pretty standard in 2013) you could watch multiple games at one time via DirecTV and ESPN3. On DirecTV you had your main games you flipped between, your XBOX 360 had another game or two via ESPN3 (any game on ESPN3, ESPNU and even ESPN2 was accessible), and yet another game via ESPN3 on your laptop. This year, unless you are a TV and internet customer of the cable provider (Comcast cable and Comcast internet for example) you can only get games shown exclusively on ESPN3. If you do have this, you’re in great shape. If you have DirecTV, we’ll you’re hosed. Why was something available last year and not this year? Probably because contracts got renegotiated at some point between last season and this season and with all of the conference realignment going on that is probably a safe bet. 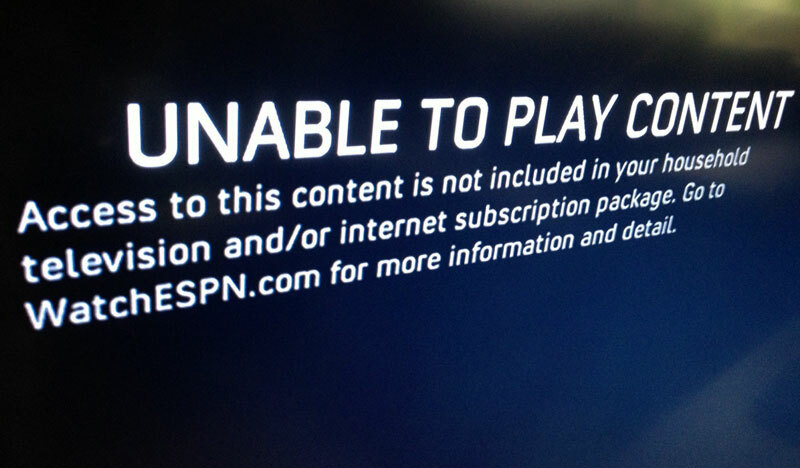 But why would ESPN, the profit center for Disney, backtrack on showing games? Isn’t showing more games, and selling more advertising a great way to make money? Is ESPN really worried about people the digital world cannibalizing the TV profit? What is this, 2006? In ESPN’s defense, they are not the only one who do this. The Big Ten Network does not allow you watch a game online if it is being broadcast of the Big Ten Network (as we’ve been told by the DirecTV customer service rep). The bigger questions still remain why? Why treat TV and online separate when as recently as last season they we’re considered almost equal? Why must you have a TV and internet subscription to watch games on laptop, XBOX or tablet? Why isn’t an internet subscription enough? Why limit your customer base to those who have a cable TV subscription? By cutting out the DirecTV customers your losing 20 million people in the US. Could DirecTV help? Sure but their iPad app is…well horrible. You can only watch certain channels and only within your home. That’s like buying a car and only being allowed on certain streets. There are answers out there. The short-term one is Slingbox. This device will make a comeback but not without a price. You’ll need another DirecTV receiver in another room. Kind of a bummer and a lot more money. The long-term answer is for ESPN, the Big Ten Network, NBC Sports Network, and Fox Sports, to come up with a digital answer…not to say that they don’t already have one. For example, when ESPN3 shows CFL games, there are ads during the commercial breaks of the broadcasted game. Yes it’s a bit of an apples and oranges comparison but not really. Why can’t ESPN, FOX, NBC and others run different ads online as they do on air? It’s not like they aren’t doing it already. What is really sad is how unprogressive ESPN and others have become. They are taking steps back instead of forward and giving credence that the ‘any device anytime’ line is really just lip service. What happens now is that fans will use pirated streams to watch the games. Nobody wins there. If the folks at Fox Sports, NBC, and the Big Ten Network (partially owned by Fox by the way) were smart they would flood the digital space with live, free streaming and sell the bejesus out of it. It’s a white space that can be stolen right from under ESPN’s nose. Then again, maybe this is another reason why the digital world will never overtake TV.